SOLD Many of Rebajes popular designs were executed in silver plate or sterling as well as copper. 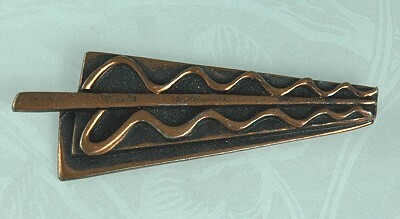 This beautiful modern "Serpent and Staff" pin is one of those pieces. The silver plated version can be seen in the book Copper Art Jewelry by Burkholz and Kaplan on page 63. The hallmark appears on the reverse. Condition: Excellent vintage. Unpolished. Nice patina. Measurements: 2 7/8" wide and 1" long.